Summer has arrived here in Birmingham, Ala. While that doesn’t mean an end to outdoor workouts, having something to sip while I sweat has moved from nicety to necessity. Summer has arrived here in Birmingham, Ala. While that doesn’t mean an end to outdoor workouts, having something to sip while I sweat has moved from nicety to necessity. One thing I dread, though, is that moment at which the sun turns my beverage from refreshingly cool to revoltingly warm. 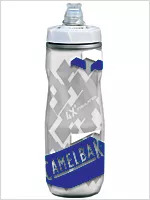 So I was intrigued to hear about CamelBak’s new Podium Ice water bottle, whose insulation supposedly keeps water cold four times longer than regular bottles’. I devised an admittedly less-than-scientific test to check that out. At 6:30 a.m., I filled the Podium Ice and a regular water bottle with ice cubes and water. An hour later, the ice had melted in both, though the water was still chilly. The regular bottle was covered with condensation. However, the Podium Ice was dry on the outside—score one for CamelBak, if only because I hate it when my water bottle sweats more than I do. I checked the bottles every 30 minutes for the next couple of hours, and the water in the Podium Ice was consistently cooler. By 9:00 a.m. the liquid in my regular bottle was lukewarm, but the CamelBak’s still had a touch of chill. So I put it outside in direct, 85ish-degree sunlight, (until then, I’d kept both bottles inside). Two hours later, the water was still drinkably cool. That impressed me. Other things to like: Instead of a pesky screw top, the bottle has a valve you can open and close without actually touching the drinking tip with germy fingers. And when it’s closed, it simply doesn’t leak, no matter how often you tip it over. Plus, even though it’s marketed as a “bike bottle,” the Podium Ice fits perfectly into the hydration belt I wear for walking and skating. A couple of less likable things: You can’t put it in the dishwasher (a noteworthy minus for busy working moms like myself), plus it looks really utilitarian. But hey, if the trade-off for refreshing summer-workout sips is a little extra time at the sink and a bit of hydration homeliness, so be it. Pros: It keeps water cool during long, hot workouts and won’t leak when tipped. Cons: You have to hand wash it. Extra tip: Click here for helpful tips from the American Council on Exercise on exercising safely in the heat.